Old Ferguson West Community Garden orchard installation with Giving Grove, Fall 2017. At Gateway Greening we believe St. Louis is only as strong as its communities. Our vision is a region where people are connected to the land, to their food, and to each other in deeply rooted, resilient urban communities. Since 1984, Gateway Greening has supported food-producing community projects. However, community groups want to grow more than just vegetables, they want to expand their projects to grow fruit and nut crops. In 2017, Gateway Greening partnered with the Giving Grove of Kansas City, MO to bring their community orchard program to St. Louis. This program will allow us to assist community groups in growing a broad diversity of fruit and nut crops that are naturally disease resistant, using a holistic management program that the Kansas City Giving Grove has been using successfully for five years. As of fall 2017, the Giving Grove in Kansas City has provided over 2,000 fruit and nut bearing plants across Kansas City, and we hope to plant many more here in St. Louis in the years to come. Rob Reiman, the Giving Grove’s Executive Director said, “We are beyond thrilled to be able to collaborate with Gateway Greening to help bring sustainable orchards to more food insecure communities in the St. Louis area.” Small community orchards have incredible potential to produce fresh produce for many St. Louis communities. An average Giving Grove orchard in Kansas City contains 15 trees and is capable of producing over 3,500 pounds of produce each year once the plants reach maturity. 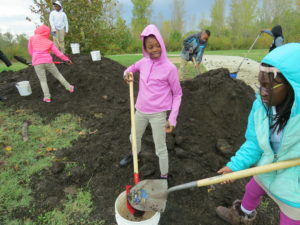 Gateway elementary students hard at work moving compost and fresh soil for the new Giving Grove orchard installed at their school. To date, Giving Grove orchards in St. Louis have been installed at Old Ferguson West Community Garden, Stix ECC Early Childhood Center, Gateway Elementary School, Gateway Michael Elementary School, Central Reform Congregation Community Garden, and Florissant Community Garden. Who is eligible for a Giving Grove? Over the years, we have found that community groups who complete our garden development process create long-lasting, supported, community spaces. We believe that new orchards will be similarly sustainable and locally beneficial if they are community-led projects. Gateway Greening Network gardens will be able to request Giving Grove orchard plants and materials through the newly created Orchard Expansion Application in May and October. Non-network community groups will be asked to complete our development process. This process assists community groups in identifying local resources, engaging community members, and creating long-term management plans. Once completed, the orchard project will be considered “in-network” and eligible for all of the same benefits as community gardens, in addition to the tools and materials specific to orchards. What is the Cost of an Orchard? There is a one-time cost for materials when installing a Giving Grove, however, in order to make orcharding accessible for everyone in St. Louis, we are offering scholarships that will reduce the cost of installation by 50% or 90%. For the one time cost, community groups will receive: the plant, support stakes or poles, soil amendments during planting, additional soil, burlap, wood chip mulch, and tree wraps. The per plant costs vary from $5-$50 depending on the size and type of plat installed. Proper care and maintenance is important for the long-term health and productivity for any orchard. Gateway Greening will be offering ongoing, free education for anyone who wishes to learn more about orchard care. Please visit our events calendar to learn more about upcoming orchard classes. Please visit the Giving Grove page on our website or contact Community Projects Manager Dean Gunderson at dean@gatewaygreening.org or at 314-588-9600 x108 to learn more. Giving Grove installation at Florissant Community Garden with garden members and volunteers from The Burning Kumquat (Washington University) and Gateway Greening.